Grease a pizza pan with butter (I used a 12” air-bake pan). Stretch the dough to the edges of the pan and cover it with a towel. Let it rise for about 30 minutes or until it doubles in size. Preheat the oven to 400 degrees. While the dough is rising, prepare the topping for the pizza by slicing the tomato, onion, mushrooms and bell pepper into whatever size you prefer. Once the dough has risen, make depressions in the dough with your fingers and form a crust. Brush the top of the pizza dough with 3 Tb of olive oil. Now it’s time to form the pizza!!! 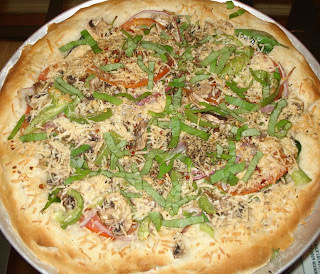 Place the spinach, tomatoes, onions, mushrooms, and bell peppers directly on the flatbread. Season the pizza with Italian seasoning, crushed red peppers, and black pepper. Add the shredded cheese on top and season the entire pizza again. Put the pizza in the oven and bake on 400 degrees for 13 minutes or until the bread is cooked. Once the entire pizza is finished, top it off with fresh basil (either in thin slices or whole) & serve. Place all of the ingredients into your bread machine (except the 3 Tb of olive oil) according to the directions on your machine. Most machines will have the wet ingredients first, dry ingredients on top and yeast last (so that it’s not touching the water). Select the Dough/ Manual Cycle and start. Remove the dough from the pan (lightly flour your hands to keep the dough from sticking to you). Cover and let it rest for 10 mins (your bread machine may already factor this rest time at the end of your dough cycle). Hey Sak May! Love your blog. I never knew you were so into food!? "that's not delivery...that's home made" I LOVE IT...you and nick could totally pitch a hip hop cooking show to food network!!!! Love me some pizza!! None of that American cheese bull#$%@! !